Once you have made a decision to have an outdoor event, the chance of inclement weather the day of your event naturally becomes a concern. A tent rental will bring peace of mind and at the same time add a special elegance to the affair. 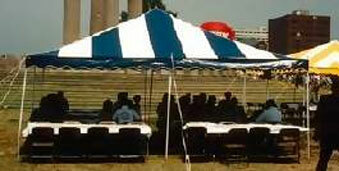 Our NJ tent rentals are available in various shapes and sizes to fit nearly any site requirement. They may be used to cover the main party area, but can also be combined to cover walkways, decks and other specialized areas. Dance floors, staging, electrical service and lighting may be added to meet your specific needs. Heating and cooling is always possible should the weather make it necessary. Larger tent installations are customized to fit the site and will require the expertise of a professional to layout the installation. Our party consultants will be happy to visit your location and prepare a design that compliments the site and provides the necessary protection from the elements. Once the design has been completed a price quote can be prepared. To guarantee availability of our tent stock, we recommend that you call well in advance of your event to place your order. This type of tent requires the use of central poles to support the overhead tent material. Shorter side poles are used at regular intervals to support the outside edges. Stability for the structure is gained by tension derived from ropes attached to the perimeter of the tent extending from the exterior poles to their corresponding metal stake. The ropes and staking requires approximately an 8' perimeter around all four sides of the tent. This type of tent must be installed by a professional. Frame tents are self-supporting and as the name implies, utilizes an overhead aluminum frame to support the tent fabric. The advantage to this type of tent is that it can be placed directly against other structures such as houses, garages or even larger tents. As the frame tent doesn’t require stakes for support, it makes them ideal for decks, driveways, walkways and patios. These tents must be installed by a professional. Sidewalls come in various widths and lengths to accommodate virtually any installation. Pictured is our Cathedral Window sidewall which are available on all of our tent installations. Our Sidewalls can also be incorporated into existing structures such as covered porches, porticos, under second story decks etc... Should you need to create an elegant entrance for your event, we can install a set of custom French Doors. Feel free to contact us us with your special requests. Tent lighting can be as simple as a single light fixture or something more complex such as chandeliers, spot lights, accent lighting or perhaps something more custom to fit your needs and taste. We can accommodate virtually any request. The above pictures are samples of some our standard lighting packages. Staging can be used to support bands, DJs, speaking guests etc... Staging can also be incorporated as a sub floor for tent installations where the ground is uneven or unsuitable for an event. For special events, such as weddings and parties where music and dancing are sure to be central part of your special occassion, Starr's Party & Tent Rentals offers an array of options for your event. Please note. Dance floors used outdoors must be protected from the elements and will only be rented in conjunction with our installed tent rentals. Guests will arrive in Hollywood style with our regal red carpets. Perfect for: Grand Openings, Sweet 16 Parties. Corporate Events, Proms, Award Ceremonies & Premier Events. Our tent heaters are electrically fired, thermostatically controlled and run on propane fuel. These heaters are very quiet and 99% efficient. Heaters are placed outside the tent and the heat is then blown in using an air duct. Using this method creates a warm space with out the noise or unsightliness of a heater in your event space. Different types of fans can be used to promote good air circulation. Air Conditioning is also available and priced per event. A Canopy Tent is a light gauge Do-It-Yourself tent that can be easily installed by the average person on any grassy location. This tent is available in 20'x20' Blue & White Stripe. Rental Price: $160.00 | Note: This tent is not available with sidewalls and is not suitable for extreme weather conditions.